Gymnastics: What Do You Want to Do With Your Body? The CrossFit Gymnastics Trainer Course sets athletes up for a lifetime of strength and movement. Identifying and correcting range-of-motion, stability and technique issues will pay dividends when athletes are upside down. Many exercises commonly used in CrossFit are also frequently used by athletes participating in other sports. However, the handstand—fundamental to gymnastics—is a rarely employed training tool in other sports but an essential part of CrossFit. Learning gymnastics skills can be frustrating, but Dave Durante explains why the return is well worth the investment. Be patient and limit frustration. These are the first two points on a list I share whenever I’m speaking about gymnastics to a new group of CrossFit athletes. 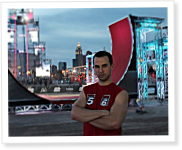 “American Ninja Warrior” qualifiers meet in Sin City to try and conquer Mt. Midoriyama for the first time. It’s hard to catch your breath in Las Vegas, Nevada. In a city renowned for its sights—but not its views—the American Ninja Warrior Final transformed a dusty parking lot in the desert into a glowing extension of the famed Las Vegas Strip. The recommended prerequisites for a backward roll to support on the rings are a strict muscle-up and a deep ring push-up, according to Dusty Hyland of Dogtown CrossFit. “The backward roll is literally just a pull-over on the dynamic apparatus of the rings,” he explains. The first step is employing the false grip, Hyland says. When Andrew Creary played football at Hampton University, he could bench 356 lb. and squat more than 500 lb. But at 240 lb., he couldn’t do one pull-up. 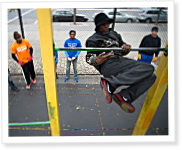 Today, things are different: He’s a member of Bartendaz NYC out of Harlem. The experience has provided more than just physical fitness. “I want to progress, but you have to know that that goes with life. You want to always learn. The smartest person knows that he can know more,” he says.